Happy Australia Day everyone. Get amongst the Aussie BBQs, lamingtons, pavs and pies and have a fun time. I have always had a little weak spot for pies growing up. I am a party pie over sausage roll girl. After netball on Saturdays dad and I used to go to Jesters for a pie – my pick always being the “Nutty Chook” aka satay chicken. Satay would have to be my favourite savoury flavour hands down. Let’s be honest anything that is peanut butter flavoured would be my ultimate meal. Satay burger, satay pie, satay pizza, satay curry or satay noodle stirfry you name it! So fellow pie lovers, look no further. 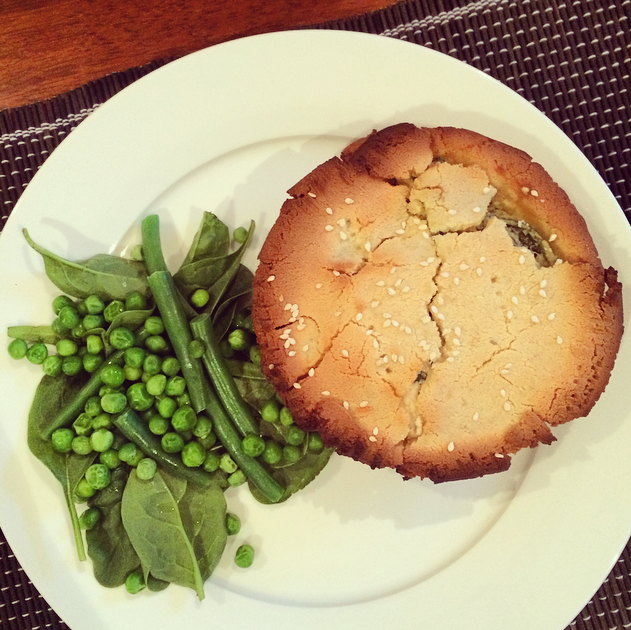 I have created a sort of Aussie satay pie that is guaranteed to be a success… And it is nutritionally packed with healthy benefits too. The chicken was tender, the satay had a nice coconutty peanut flavour with a spicy kick and the pastry was nice and crunchy. I used individual pie pans/tins but you could make one large pie too. METHOD: Dice onion and set aside. Chop chicken breasts into small cubes. In a large pot on the stove add the spices, herbs, coconut oil, garlic, ginger and brown onion. Sauté for 3-4 minutes. Add the peanut butter and coconut water. When you reach a sauce like consistency add the chicken and stir. Cover the pot and reduce the heat and let it simmer for 15-20 minutes. Meanwhile you will need to prep the pie crusts. Preheat oven to 180 degrees Celsius. Using a rolling pin flatten out the pie crust* until about 0.5cm thick. Cut appropriate circle size and press into greased pie dish. Blind bake for 8-12 minutes until brown. If you are using pre rolled puff pastry simply cut the circle and press into tins. Make sure you blind bake with baking beads or rice to prevent the puff pastry from rising. Again 8-12 minutes. Remove from oven. 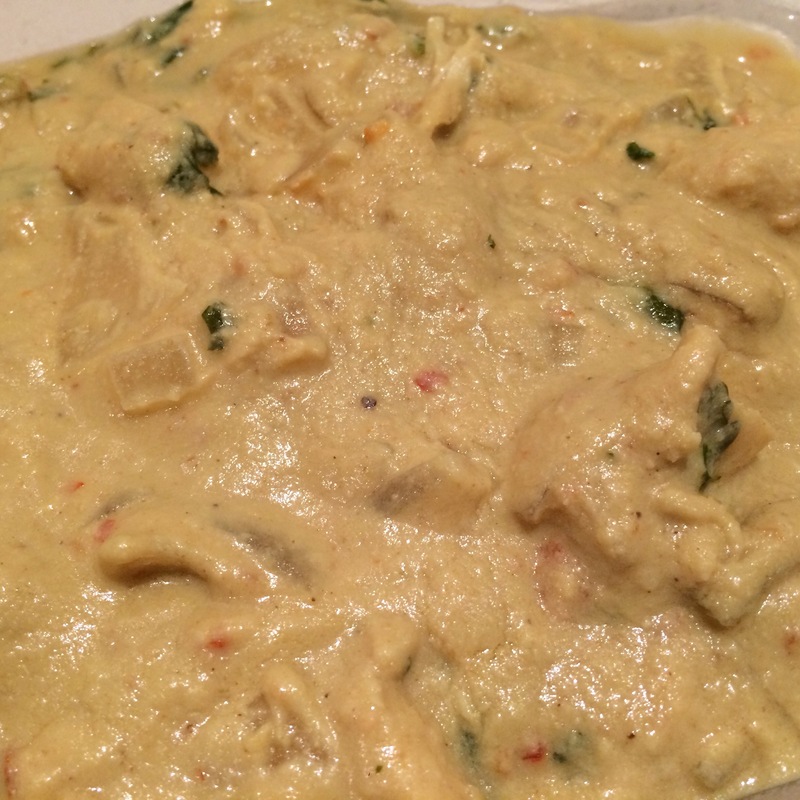 Fill the pie bases with the satay filling. Cut a circle for the pie lid, place it on top and seal it with a fork around the edges. Top with cracked pepper and sesame seeds. Wash lightly with milk to brown the pastry and bake in oven for 15-20 minutes until the pastry is nice and brown and flaky. Ovens will vary. 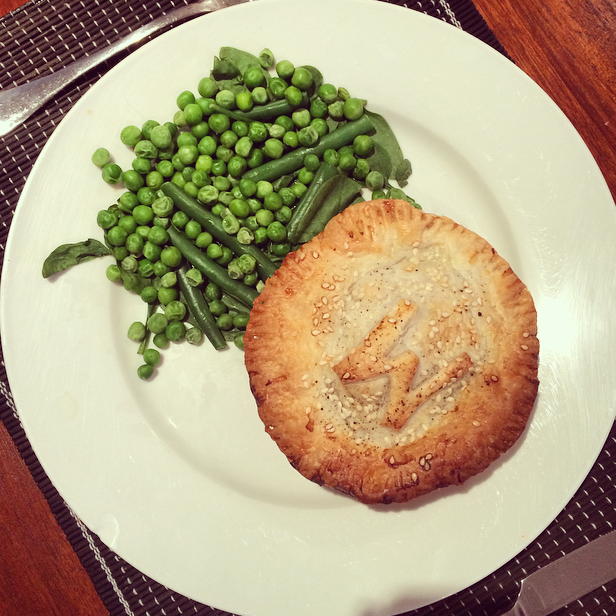 Serve with an Aussie green pea salad which compliments the pies perfectly. I certainly haven’t perfected my own pastry recipe but this was one that I tried. However, it was a bit crumbly and fell apart very easily. Most likely didn’t cook it long enough. But it still tasted delish! Pulse all ingredients in food processor until a dough forms. Roll into a ball and wrap in glad wrap and place in fridge for at least 1 hour. Take out of fridge 30 mins before rolling and follow same method as above.